Village Palm is one of my favorite Lilly Pulitzer stores. Sarah is so helpful and she let me know that they are having a huge sale! The entire store is on sale except stationery and jewelry. 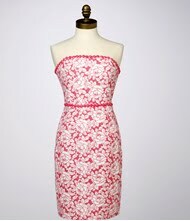 What a great time to stock up on Lilly while it is warm enough to wear summer clothes. Here are some things that are in stock at the store. There may be a few other styles and a few random mckim colors left; please call Sarah for availability. There are lots of Spaghetti strap McKims in black, pink, silver and gold at 50% off. You can reach Sarah by phone at 313-882-7256. Happy Shopping! What is still on your shopping list from Summer 2010? I think I still "need" an Olette top. ohhhh you ladies have fun shopping! We have nothing like this here.....nothing! Thanks for letting us know! Do you know if they have the Nettie dress, and is it on sale? Thanks!